She then played all the Op.25 set of Chopin Etudes which for me at least was a revelation. She revealed all manner of inner complexities invisible to me previously, as well as delineating the familiar approaches one tends to absorb as the benchmark. And then comes along a supremely musical individual like this...It was one of those outstanding performances of a much loved work where one has absolutely nothing to say after it is complete - a completely integrated, brilliant and consistent vision of these taxing Études. The Sonata Op. 35 was perhaps modelled by Chopin on Beethoven's own funeral sonata Op.26 which he taught and played. Here Klinton gave us a searching interpretation of immense individuality and fatalistic penetration especially the Marche funèbre. Threat and tragedy hovered above the entire reading. And so it was with great anticipation that I have listened and compared two CDs she has recorded to date. 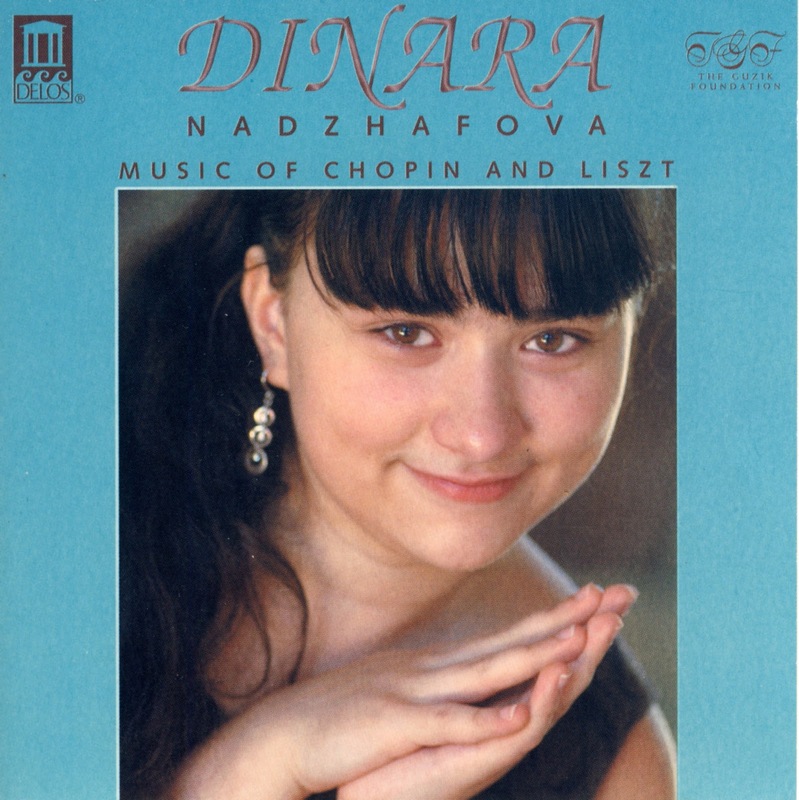 The first was in 2007 of Liszt and Chopin (for the Guzic Foundation on the Delos label) under her birth name Dinara Nadzhafova when she was merely sixteen; the second as Dinara Klinton, her most recent 2016 recording of the Liszt Études d’exécution Transcendante for the esteemed German label Genuin. A fascinating contrast emerges which is most instructive as to how young pianists of immense talent develop. The first CD was a result of her being chosen for a Guzik Foundation Award on their scholarship programme. The cream of Russian musical virtuosi are selected for the award to assist deserving young talent. From the sleeve note I read: ‘The children who compete in the Guzik Foundation programmes generally come from families of meagre resources, often single-parent families living in poverty.’ Another laudable reason to listen carefully to what Dinara Klinton has achieved through sheer talent and dedication in the face of adversity. The first thing that struck me was remarkably individual tone and ‘voice’ of this young pianist of 16. She has a complete command of the keyboard. The synapses of the ‘little grey cells’ spectacularly firing in her brain are surely a gift from God. In this first CD she revels with understandable youthful exuberance in her power and ‘what she can do’ seemingly without effort and yet with power in reserve. This was clear in the superb articulation in the Liszt Hungarian Rhapsodies No 2 and 6. One should not approach them as ‘deep philosophical works’ but as exciting cultural explorations which she accomplished so well with vigorous rhythmic drive. 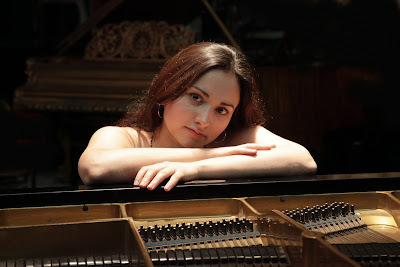 Her feeling for Romantic nuance was evident in the Liszt Sonetto 123 del Petrarca from the Annéees de Pèlerinage Deuxième Année : Italie and the Liebestraum No:3 in A flat major. The Liszt Feux follets was taken at a slightly faster tempo than her more recent recording but revealed the virtuosic feathery lightness, velocity, charm and finger dexterity of a generation of pianists I thought had passed forever – that late nineteenth century school of towering virtuosos - Godowsky, Lehvinne, Rosenthal, Hofmann. Of course she has not yet developed their deep musicality and command but the seeds were definitely there ready to develop at an early age. This was also evident in her performance of the Chopin Études Op. 10. The beginning is a veritable eruption of virtuosity. A brilliant set in so many ways but for me lacking in the lyrical poetry that inevitably comes with age and experience. But what a foundation this young lady had to build on at 16 – surely the envy of all her peers! Now to her most recent CD of the Liszt Douze Études d’exécution Transcendante some ten years later. What have we now then? Certainly an ambitious CD debut and fearless laying out of your cards upon the table as a young pianist. A brief examination of Liszt’s intentions in this fiendish work is instructive. Nine of the twelve Études of the 1851 version were given titles by the composer. One is forced as an interpreter to assess the significance of the titles, assuming as given a command of the extreme keyboard virtuosity demanded by them. We are forced in a way to ‘focus’ on the poetic idea inherent in the title taking us as listeners into the musical ‘programme’, something seemingly at odds with the pedagogical associations of the nature of the piano Étude. In this regard Dinara Klinton has few peers, if any, among young pianists excepting shall we say the breathtaking Daniil Trifonov. Certainly the titles given by Liszt influences the listener and possibly the approach of the pianist to these demanding works. The German musicologist and author Frederick Niecks considered the titles ‘fanciful afterthoughts’ but is there not more to the titles than this? In his Gesammelte Schriften Liszt writes ‘In programme music…the return, change, modification, and modulation of the motives are conditioned by their relation to a poetic idea.’ Certainly it cannot be denied that the titles are a significant part of the aesthetic nature of these works. Chopin in his two sets of Études eschewed, in fact militated against giving his works titles by poetically inclined publishers and their close attention to the agenda of sheet music sales. However quite unlike the ‘absolute’ music of Chopin (pace possibly one or two of the Ballades) one must never forget the literary dimension of so much of Liszt’s thought and inspiration, the profound effect of the life and poetry of Byron and Victor Hugo on the evolution of the musical Romantic movement in Europe. This was when poetry had the power to influence behaviour – seldom experienced today. We are far in 2016 from the definition of the poet by Shelley as ‘the acknowledged legislator of the world.’ Liszt was an excellent writer himself. Poetry was of immense importance and inspiration to artists in all the artistic disciplines, something contemporary artists have largely lost. All his life the great painter J.M.W. Turner attached poetic quotations, sometimes his own verse, to his paintings in addition to a title as an ‘extra dimension’ for the soul to inhabit. One of the great achievements of Klinton’s performance is to rescue Liszt from the persistent image of being merely a keyboard ‘wizard’. He is still being consigned to the margins of serious composition by far too many listeners, critics and musicologists. Under her fingers each Étude becomes a moving, on occasion humanistic and noble, symphonic poem that speaks poetic volumes. In her introduction to the CD she perceptively and quite accurately refers to them as ‘emotional soundscapes’. Her interpretations are achievements of sensibility that are far more than excuses for tremendous virtuosic display (although they are partly of course as is sometimes the case of the great Lazar Berman and György Cziffra). Here an inquiring, analytical intelligence and sensibility underpins an astonishing sound palette and mastery of the keyboard. Klinton writes further ‘…Liszt explores the infinite variety of human life via feelings of joy, sorrow, love, anger, dignity and defeat. Each study has its own unique expressive profile, which makes unifying the cycle especially challenging.’ Such expressive depth and musical aspiration is most uncommon among young virtuoso pianists, especially in Liszt. I cannot help feeling this true spiritual depth may well have grown organically from her personal background of comparative deprivation and struggle. The opening Preludio functions not essentially as poetry but as an introduction, immediately attracting our attention to the depth and richness of her tone quality, touch, dynamic range and finger dexterity. Similar observations could be made for the untitled second étude which in many ways is also a virtuosic Prélude in the manner of Paganini or perhaps even a premonition of the dramas to come. The far more substantial and atmospheric third entitled Paysage transports us into the nineteenth century concept of the pastoral. ‘Nature’ in the early nineteenth century had abandoned the eighteenth century bucolic idea of the rococo pastoral and Watteauesque fêtes galantes and gathered about itself connotations of Nature as a powerful yet humanly indifferent ‘force’, a threat and stormy turbulence interspersed with lyrical, reflective episodes. Klinton captures this unified mood of subdued reflection, perfectly in keeping with its vague pantheistic pastoral ‘programme’ or rather associative idea. Although there is no orage (storm) common to this genre, she captures the central emotional agitation and passion of a ‘human figure in the landscape’ and then allows its presence to subside in a beautiful rocking motion, fading away as evening gathers into dusk. The cruelty of Mazeppa then suddenly erupts over us, the fourth and arguably most tempestuous of the Grandes Études. Was Liszt inspired by the Victor Hugo poem taken from Les Orientales or possibly Byron’s poem Mazeppa? The story itself is well known. The Ukrainian nobleman Ivan Mazepa has an adulterous love affair with a Countess Theresa while serving as a page at the Court of the Polish King Jan II Kazimierz Waza. When all is revealed (as is usually the case) the Count punishes Mazeppa by tying him backwards and naked to a wild horse and setting the horse bolting across the steppes, through woods, forests and across freezing rivers until it expires through exhaustion. Mazeppa survives the ordeal, emerges triumphant and is elevated to a Cossack Hetman. The music follows this ‘programme’ possibly more literally than others in the set. Klinton captures the panicked, uneven, relentless almost hysterical galloping rhythm of the horse frighteningly well (if you have ever ridden it is possible to imagine the frightful torture for the animal as well as the man tied as he was in that grotesque position). Exhaustion. Death. The survival of Mazeppa. Ultimate triumph – the sub-textual allegory of the artistic life of Ferenc Liszt perfectly delineated. Her judicious use of the pedal in this work assisted the rhythmic articulation and inexorable forward drive brilliantly. A ‘warhorse’ of distinction. Klinton is already well known for her astonishing account of Feux Follets. Emanuel Ax laughed in astonished pleasure on hearing her in this work. Still present from her teenage years is that virtuosic feathery lightness, velocity, articulation, charm and finger dexterity of a generation of pianists I thought had passed forever. Present too in these Will-o’-the-Wisps or Jack o’Lantern is the ominous atmosphere of ghostly light and phosphorescence, possibly fire-flies, that hover over swamps, boggy ground and marshes leading wayfarers to their doom (her glittering, evanescent tone palette here is extraordinary). Few pianists can achieve the light scherzo, Queen Mab character as strongly in this work, possibly inspired by Goethe’s Faust. A quick-silver phantasmagoria of impressionism as bewildering as the Will-o’-the-Wisps themselves. With Liszt we are quite often in the presence of meditations on death – well it was a closer companion in the mid nineteenth century. With Visions Klinton captures the grim psychological reality of death with the heavy tread of a fantasy Liszt constructed around the Dies Irae together with a tumult of church bells. Was the piece composed in memory of Napoleon as some have speculated? Was it inspired by an ode of Victor Hugo? Does this matter? Certainly the work possesses an heroic mien of inevitability, the tragedy of a Miltonic vision together with intimations of immortality. The title itself reeks of metaphysicality. So much is apparent from the way Klinton creates this ominous atmosphere with immense weight and depth of piano sound in the chordal/choral passages as we approach the gathering darkness, a destiny we must all face with defiance. Such an excellent recording of the instrument by the Genuin technicians. In the remarkably interesting book Programme Music in the Last Four Centuries (London and New York 1907), the author Frederick Niecks expostulates ‘What vast subjects, for instance, are indicated by single words such as Faust, Hamlet, Manfred, Hebrides, Eroica, Hungaria &!’ It is impossible when reading the Lisztian title of number seven, ‘Eroica’, to escape a flurry of Beethovenian associations, the myth of Prometheus or once again connotations of the heroic Napoleon. The composer was fascinated by heroes and epic historical achievements although not as obsessed by this as Wagner. Here we have expressed in music Byronic individuality, the impulse to action, defiance, to fight the fate we have been handed at birth. There is clearly no literal ‘programme’ in this Étude but the mythical atmosphere of noble military resistance is inescapable. Jim Samson (to whom I am greatly indebted in this review and his book Virtuosity and the Musical Work - Cambridge 2003) sees affinities with the first of the similarly titled Douze Études de salon Op.5 similarly named Eroica by the unjustly neglected German composer Adolf von Henselt. It is difficult for the modern sensibility to immerse itself in the unfamiliar atmosphere of conduct and emotion pertaining to military matters before the defining ignoble tragedy and irreversible sea-change of the Great War. Klinton gives this work the appropriate military stature. She literally erupts into the Presto Furioso of Wilde Jagd with an unsettling vengeance and demonic force. Such ‘wild demented horse rides’ through forest and across plains were an integral part of the Romantic Gothic imagination. A modern equivalent might be a wild drive in a Ferrari (the prancing horse) through the Black Forest pursued not by demons but the police. The smell of sulphur pervades this supernatural ride as it does the B minor Sonata or Dante Sonata. The grotesque, possessed associations of a ‘Witches’ Sabbath’ inspired many composers from Weber through Berlioz to Ravel. The baleful atmosphere of the paintings of Henry Fuseli rightfully invest the interpretation. The ninth in the series entitled Ricordanza is an intensely personal, self-communing piece by Liszt. Busoni called it ‘a bundle of faded love letters’. I felt Klinton managed the transition from the clearly delineated physical wildness of the former ride into this diffuse, soft focus, poetic meditation as if it were the Adagio of a classical sonata – quite brilliant and a seemingly inevitable and welcome respite after the emotional storm that preceded it. This enabled her to demonstrate her fine control of cantabile tone and long, sung legato line, the piece being essentially a song of ‘emotions recollected in tranquility’ as Wordsworth expressed such feelings so accurately in the Preface to Lyrical Ballads. The tenth is a tremendously powerful and emotional work despite not having the support of a title. But then F-minor and F-sharp minor are my favourite keys. Here Liszt embraces Chopin. His respect for the Chopin Études is as well known as Chopin’s admiration of Liszt’s performance of them. At times Liszt lays his own composition over the Chopin Étude Op. 10 No.9, borrowing and augmenting the idiom of the Pole. Klinton is an intuitive Chopin interpreter of great stature, qualities that are rare in the young and not given to many of any age despite the popularity of this deceptively accessible composer. Her instinctive rubato in this commanding and movingly passionate virtuoso interpretation comes directly from her penetration of the soul of the Chopin Études. Softly the bells toll at dusk as the lover wanders in a pastoral reverie, perhaps in a park in Weimar, passing by Goethe’s summer house, wood smoke in the air and the burble of the nearby Ilm river. He begins to dwell on his feelings for the seductive other who has captured his heart in a net. We begin to inexorably move into his ‘human, all to human’ mind as he imagines his beloved, we feel his fears and apprehensions, experience his almost coarse desire, his passions rising and falling in waves of increasing ecstasy, finally reaching an apotheosis. These debilitating emotions slowly fade as he returns to the calm of evening, ‘calm again now my heart’ as if the soft wings of a night moth had settled over him. Klinton’s instinctive rubato and tone colour manages the transition from pastoral idyll to rhapsodic oceanic waves of sound with perfect control and judgement and then the elegiac return to the calm reflective soul as the night harmonies close over us in a dream. A wonderful performance. A return to the power and threat of nature in a form envisaged by J.M.W. Turner rather than its ability to lead us to the world of lyrical dreams suffuses the final Étude entitled Chasse-neige (Snow-drift, Snow-storm, literally Snow-plough). One has no difficulty in envisioning a tumultuous winter scene as a snow storm begins to rage and inexorably buries all human life and civilization beneath it. Klinton gives a fine atmospheric, impressionistic interpretation of the work with superb use of the pedal. She accomplishes this soft focus yet powerful snowstorm in a Debussyian sense rather than taking the opportunity to display sheer declamatory virtuosic power, tempting as that may be in such a piece. Interestingly her approach shifts the emphasis from amazement at the performer to the work itself and its meaning as a painting in sound. Lazar Berman in his 1963 Melodiya recording of the Études gives such a simply astounding performance of finger dexterity and sheer visceral excitement that it distracts one from what I imagine to be the essential Lisztian poetic intention of Chasse-neige. But then Liszt himself, although a great and extraordinarily generous man as well as revolutionary composer, was a mass of contradictions as is any pianist overburdened with supreme technical facility at the keyboard. Dinara Klinton is never tempted by ego-driven superficial display as she moves towards becoming not ‘merely’ a fine pianist but a truly distinguished artist. A remarkable CD debut by any musical standard one might care to mention.